Cats are well known for their weird, lovable antics, and eating dirt is definitely one of their more-puzzling behaviors. There may very well be a cause behind this unusual habit—possibly diet, medical issues, stress, or boredom. Then again, some cats munch soil for no apparent reason. If you can identify the cause, either you or your vet may be able to address it. If not, you can still take steps to discourage your kitty from dining on dirt. Why Do Cats Eat Dirt? Kittens eat inappropriate things all the time. It may be dirt, plastic, or any variety of stuff; it's their way of exploring their new world and discovering what's edible and what's not. When an adult cat eats dirt or other items that aren't food, it's called pica. There are several possible causes of pica in an adult cat. But because the behavior may be a symptom of a medical issue, it's best to mention it to your veterinarian on your next visit. If you think it can't wait or you notice other unusual behavior, give the vet a call to discuss the issue. Catching a disease early is often critical to successful treatment, so it's important to work closely with your vet to rule out possible medical conditions that may be causing the behavior. 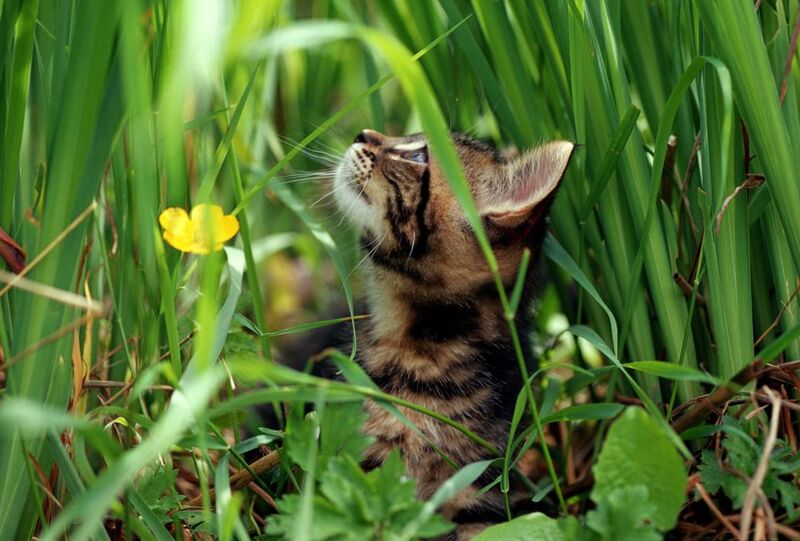 Adult cats that eat dirt may be suffering from a lack of nutrients and vitamins in their food. Consider switching to a food that offers more complete nutrition; read the label carefully so you know what ingredients it contains or ask your vet for a recommendation. You can also skip commercial cat food entirely and start making your own at home. Topping your cat's wet or dry food with a tiny bit of cat-safe human food, such as cooked lean meat or canned or cooked fish, every now and then may work as well, but never give it any human foods that are toxic to cats. Whichever route you go, ensure that your kitty is getting a balanced diet and if you change to a different brand of food, introduce it gradually so you don't upset your cat's digestion. Pica in cats may be related to a number of health conditions. For instance, it's often linked to feline leukemia, which can be caused by a feline immunodeficiency virus, as well as anemia, a lower red blood cell or hemoglobin count. Certain types of diabetes or brain tumors may also contribute to this odd habit. An obsessive-compulsive disorder is a less likely cause, especially if the symptom emerges later in a cat's life. However, it's possible that eating strange items that aren't food indicates a genetic compulsive disorder. This tends to occur more often with particular breeds, including Siamese and other Asian breeds. Sometimes when cats are stressed, they act out in odd ways. This can happen for a variety of reasons, such as bringing a new pet or baby into the house, losing a family member, or moving to a new home. There are even times when something mundane and seemingly harmless, such as rearranging the furniture, can stress a cat out. Think about any changes—no matter how insignificant—in your household that may have taken place prior to your cat developing the dirt-eating habit. It's possible that boredom is the culprit. Cats that are left alone during the day or don't get to interact with their owners often enough may become bored. Your cat may just need more stimulation from you and its surroundings. In some cases, there may be no known cause influencing your cat's behavior. Dirt eating may just be an idiosyncrasy and something you'll need to accept. In these instances, removing the dirt from the equation (if possible) and providing plenty of other things for your cat to do may be as far as you can go. There are a number of ways you can stop your cat from eating dirt. You might need to try a few of these at the same time to find what works. Each method requires patience and consistency on your part, but if you give it some time, your cat should come around. Remove sources of dirt from your cat's life: If you allow your cat to go outside, try keeping it indoors instead. You'll also want to place potted indoor plants out of your cat's reach. Provide an enriched environment: Make sure your cat has plenty of activities and places to go so it stays occupied, engaged, and can find stress relief when needed. For instance, engage in interactive play with your cat regularly to simulate its hunting instinct and offer solo toys for when you're away. A tall scratching post, a cat tree or high perch, and a window for watching the outside world are all helpful distractions as well. Provide additional chew toys: Divert your cat's attention away from dirt with catnip or cat toys to play with. Change up your cat's toys frequently to keep things interesting. Make dirt unappetizing: If you can't remove the dirt, put an item with a strong scent next to it to deter your cat. You can try things like citrus candles, hot sauce, or vinegar. Although essential oils and products that contain them may be helpful, you need to take care not to use any that are potentially poisonous to cats. Work with a cat behaviorist: If nothing else works, seek out a professional who can help modify the behavior.